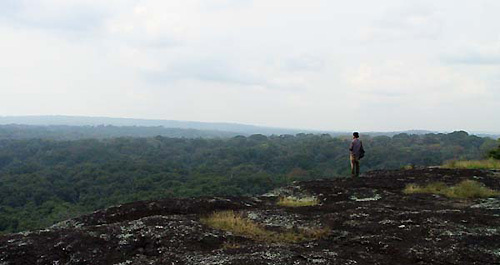 The Cameroon FS is located in the tropical rainforest in the Boumba-Ngoko district, East Province of Cameroon. Yokadouma, the division's capital, is about 600 kilometers from Yaounde, the capital of Cameroon. If everything goes well, it is possible to reach Yokadouma in the evening if one leaves Yaounde very early in the morning. Ndongo, where the FS is located, is another 300 kilometers to the south of Yokadouma along a road leading to Mouloundou on the border with Congo, and it takes at least two days from Yaounde no matter how hastily one travels. Nearby runs the Dja River, a tributary of the Congo River, and on the opposite side of the river spreads the forests of the Republic of the Congo. Researches in this region have continued since 1993. The major theme of study is forest use and shifting cultivation by the Baka hunter-gatherers and Bantu farmers, who depend heavily on the rainforest. The FS serves as a base for conducting investigations on hunter-gatherers and shifting cultivators living in the neighborhood. It is also used as a space for organizing collected materials and specimens, to exchange information and to organize simple seminars. Further, through the development and improvement of a power-generating unit, computers, communication facilities, etc., the FS can function effectively as a center for field research that is capable of linking the field with the research laboratories. Major activities in FY2003 were as follows. In July-August, ICHIKAWA Mitsuo visited Cameroon, with funding from a Grant-in-Aid for Scientific Research, and with the help of YASUOKA Hirokazu and SHIKATA Kagari, who were dispatched to the country around the same period, he carried out maintenance of the FS, which had been established in the previous year along the Ngoko River (a tributary of the Congo). In addition to the existing building, a lodging for female researchers was newly built using local materials. A large canoe was purchased and equipped with an outboard motor to be used for investigating fishing activities and migration routes among villages of the past. Furthermore, the electronic environment was developed and improved using a solar energy generation system, computers, telephones, etc., and through this a communication network was established with Kyoto and with relevant institutions in Cameroon. The FS thus began transmitting up-to-date information. 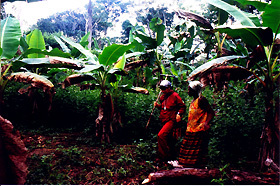 investigates plant use by the Baka hunter-gatherers. accompanies Baka people for termite collecting. 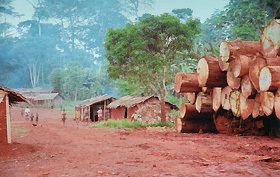 Logging closes in on a Baka village. HATTORI Shiho overlooks the tropical rainforest from the top of a giant rock. For eight months from July 2003, SIKATA Kagari (enrolled in FY2000) was dispatched to Cameroon, where she conducted basic investigation on the establishment of sustainable shifting cultivation in the rainforest. From November, HATTORI Shiho (enrolled in FY2000) was also dispatched to conduct an investigation on the use of the environment by the Baka living in the forest to the north of the FS and on the impact of forest conservation projects upon their livelihoods. INAI Hiroyuki (enrolled in FY2003), whose visit was funded by a non-21COE program, also used the FS and began his investigation of a fishing people's community in this area. In the forest about 100 kilometers north of FS as the crow flies, YASUOKA Hirokazu, who was dispatched the previous year, continued his investigation on the Baka's hunting activities and returned to Japan in October 2003. ICHIKAWA Mitsuru and KIMURA Daiji visited the FS in July - August 2003 and in December 2003 - January 2004, respectively, to conduct joint research with these graduate students and to conduct on-site education through such research. In addition to ASAFAS, researchers and graduate students of the Faculty of Science, Kyoto University, Hamamatsu University School of Medicine, Yamanashi University, Yamaguchi University, etc. are using the Cameroon FS as a research base, and the Field Station is thus serving as a research base for Japanese researchers in this area. 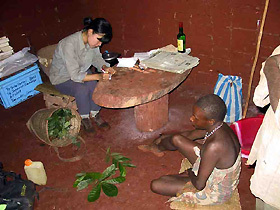 Joint research with local researchers has been conducted since 1993 when surveys in Cameroon began. However, considering the fact that Dr. Godefroy Ngima Mawoung, the Cameroon FS counterpart, recently left the Ministry of Science to move to Yaounde University, and with the launch of the 21st Century COE Program, it became desirable to conclude an agreement for academic exchanges with Yaounde University. 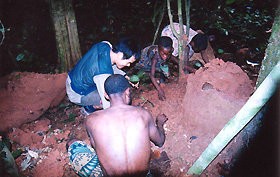 In July 2003, when ICHIKAWA visited Cameroon, he had discussions with Prof. Andre-Marie Ntsobe, Dean of the Department of Humanities and Social Sciences, University of Yaounde 1, and they reached an agreement to promote academic exchanges between the former and Kyoto University Graduate School of Asian and African Area Studies. In September of the same year, a "Memorandum of Understanding" (MOU) was exchanged to this effect between the heads of the two institutions. Future tasks will involve the implementation of joint research and education in Cameroon, including education for graduate students. In the East Province of Cameroon, where the FS was established, surveys are carried out in close contact with WWF-Cameroon, which promotes nature protection projects, Cameroon's Ministry for the Environment and Forestry (MINEF), experts from the German government's aid organization (GTZ) who are supporting the forest conservation projects, Cameroonian government officials, researchers, students, staff in charge of nature conservation promotion, and other individuals. In December 2003, jointly with these organizations and institutions, a seminar was organized in Yokadouma, the capital of the Boumba-Ngoko district, and HATTORI and SHIKATA, who were engaged in on-site research at the time, presented the outcomes of their investigations. A local radio station did a story on the seminar and the contents of the conference were broadcast. .